This book contains a set of principles for effective leadership based on timeless wisdom. When practiced regularly, they enable the leader to establish and build trust and loyalty. the result is increased productivity and higher profits. 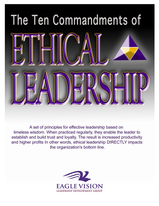 In other words, ethical leadership DIRECTLY impacts the organization’s bottom line. By following these 10 Commandments of Ethical Leadership you will be well on your way to becoming a trusted, respected and powerful leader. Then there will never be a shortage of those wanting to follow you. This will be your competitive advantage. Includes two reproducible summary articles; one with famous quotes, the other with well-known scripture references. I am fascinated by what I call Town Characters, i.e. the Crazy Lady, for the very raeosn you get at when you mention her back story. Everyone tends to know of these Town Characters, but few of us really know them. My entire Greenville book revolves around this idea of a Town Character. Even though I’ve written one book about Town Characters, I don’t think I’ve explored the idea as fully as I can. I’m sure one will pop up again in my writing.